With Love from Lohr: A visit to the Doctor..
A visit to the Doctor.. Being sick in a foreign land is an experience in itself all together...:) And when you do, you need to visit a Praxis(doctor's office) or a clinic( term used in India). Foremost you need to take an appointment. Often, the visiting time is given by the office to you. 1. In Deutschland, everybody work in the Deutsch language!!! Banks, Schools, Industries, Hospitals...everybody!!! If they happen to know the English language, they first apologize about not being good at the language and then start speaking or they simply do not know or do not want to speak!! Somehow Germans do feel they need to be perfect about the English language and hence hesitate. But honestly, broken English is better than no English to me...:D So what do you do when you do not know the language? Initially, the first few months, whenever the kids needed a shot at the doctor's I took my husband along. Over a period of time, it helped knowing a few german words. So now when I go to the doctors, here's what I say "Hallo, I have a termine at elf uhr". So there you go, two german words, termine means appointment and elf uhr means eleven a'clock!! I think numbers and how to tell the time must be learnt..:) Faces do light up when they know there are german words in between...:D After all the required documentation and billing are done you are asked to be seated in a waiting room. Then comes the fun part!!!! 2. Since you wear coats throughout the year, you are expected to remove your coat and hang it in the assigned place. Then say a HALLO or GRUß GOTT to everybody seated, sort of greeting all those who are present. Everybody greet you back in unison with a hallo!!! Initially, I found it funny and was shy, but then it is considered rude to not greet. 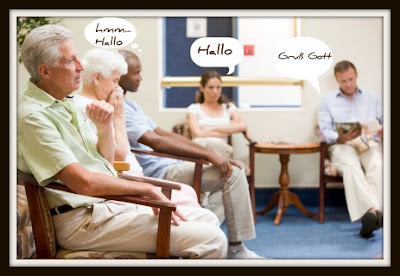 Generally, a waiting room is pretty quiet, there will be hardly any conversation happening between people. You can pass your time leafing through the Deutsch magazines, admiring the indoor plants or simply staring at the white walls...:D Waiting period is short, though I am told by fellow expats that they have waited for more than an hour to meet the doctor. 3. Once your name is called, you are escorted to the doctor's room. After a handshake and greeting, it's time to inform the doc that you do not speak German. Some show displeasure that you do not know the language and some proceed to give you advise as to begin taking classes or attend an adult school...:D At times, doctors find it hard when they are unable to explain the problem in English. It then is frustrating . So it helps to also learn the parts of the body along with the terms for pain and ache in Deutsch...:D What I love about the doctors here is that medication is given only when absolutely necessary and by that I mean, you need to be seriously very sick. So, if you are a person who is fond of popping pills for the slightest reason, then it is gonna be tough!! Sometimes, medication is provided by the doctor, else you are given a prescription to go to the Apotheke(pharmacist) and buy it yourself. Medicines which you are able to buy over the counter in your country need a prescription ( not the paracetamol and headache medicines). 4. Once you are done, you bid goodbye to the doctor by shaking hands once again and......as you collect your coat you say TSCHÜS or WIEDERSEHEN which means bye to everybody in the waiting room!!!!! I can't imagine how difficult it must be when you don't speak the same language as the doctor! Nice post May....so seeing a doc must be so difficult then..imagine going through the entire drill even if you have just a bad cough!! Ur pic is so cute! Did they notice when u went click click click? Wow...very intersting post! So, I guess I shouldn't complain when I have to wait to see my doctor for 45+ mins.,huh? Have a good one, May! WIEDASEN.....I totally knew this one because didn't they say this in one of the songs on Sound of Music? That must be real hard with the language barrier. I thought the Politicians always said the healthcare in Europe was great. You also have to greet everyone when you walk into the waiting room here in The Netherlands. I find that odd aswell but do it so I don't appear rude. Thankfully my husband comes with me to all of my appointments when I need them and translates anything that didn't come across right. Interesting post...it is also interesting that here in America we accomodate everyone's foreign language, but not in other countries. One thing I did learn was to take along a secretary from the office until I trained our driver in enough English so he could translate into Arabic for me. When neither was available, I would call Riham in the office on my cell, tell her what I wanted to say in English, and she would then translate into Arabic to the person who needed to hear it. This was even after I learnt some basic Arabic. But in cases like doctors and medication, you don't want any miscommunication to happen. Connect with me on Facebook.. The week with Scavenger Hunt Sunday. Pictures of our Weihnachtsmarkt in Lohr, 2012. With Love from Lohr by mail..
Wanna plan a trip to Deutschland?